OOTD - Mint Floral Dress | La Petite Noob | A Toronto-Based Fashion and Lifestyle Blog. Check out my lazy companion Fritz hitching a ride! Is there a particular item - or outfit - that screams summer to you? Let me know! 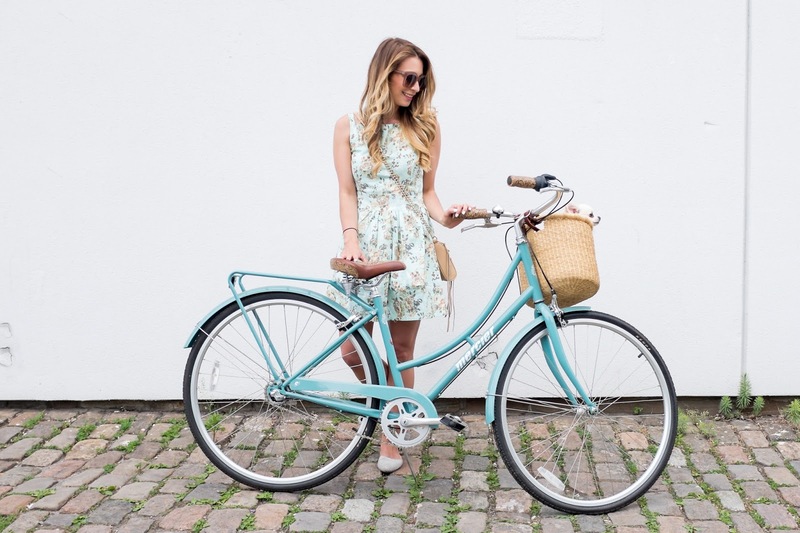 I love that your dress matches your bike, even though it's a pretty gorgeous dress on its own. The mint color is very flattering on you. Thanks Helen! I don't usually wear mint, but I think I just might start! You guys are too cute! That dress seems made for the bike. Rompers + jumpsuits! They scream summer ease to me. Great to pull on after a day on the lake or by the pool to take you straight into drinks! Ohhhh I LOVE a good romper, especially for the cottage - which I'm learning to dress more appropriately for! Are you in TO any time soon? We can pool to drinks in our rompers!